With the trade deadline fast approaching, we continue our look at the situation for each team over the coming weeks. Where do they stand, what do they need to do, and what assets do they have to fill those needs? As we continue with the Atlantic Division, here is a look at the Buffalo Sabres. By all accounts, Jeff Skinner isn’t going anywhere at the deadline and that’s all Sabres fans should really care about. Whether it’s because the team wants to use all the time they have to re-sign him or whether it’s due to his No-Movement Clause, Skinner is staying put through the end of the season, at the very least. Beyond Skinner, the Sabres lack any real rental players of value. They also lack much incentive to give up trade capital for rentals of their own; there’s realistically one playoff spot left in the Eastern Conference and Buffalo would need to pass up the surging Carolina Hurricanes and the dynastic Pittsburgh Penguins to get it. The Sabres have overachieved this season, even if their hot start to the year makes it seem like they’ve underachieved of late. No one expected this to be a playoff team, so no one will blame them for holding on to their assets and maybe moving a player or two. At the same time, it’s possible they sneak in and no one would be upset if they made a value addition or two. It’s quite possible that Buffalo stands pat at the deadline, but expect them to dabble in both the buyers’ and sellers’ markets in the coming days. Everyone wants a piece of Matt Moulson, right? How about Kevin Porter? Matt Tennyson? Honestly, the Sabres likely won’t be big sellers because there isn’t much to sell. The team’s best – and maybe only – traditional rental is 36-year-old forward Jason Pominville. Pominville got off to a strong start to the season but has been streaky the rest of the way en route to 13 goals and 23 points in 50 games. If a contender is interested in Pominville and can afford to add $5.6MM of salary for ideally a third-line forward, then the Sabres will certainly listen. However, those offers may be few and far between and, if they aren’t impressive, Buffalo might prefer to hang on to the well-like veteran. The other name that might be on the move is Group 6 UFA Danny O’Regan. O’Regan has not seen any NHL action this season after being traded away by the San Jose Sharks last year and will thus earn his free agency as an underutilized 25-year-old per the CBA. Rather than lose him for nothing, the Sabres will likely try to trade the productive minor league forward. A closer look at the Buffalo roster also reveals some non-UFA rental candidates. With excellent depth on the blue line in both veterans and promising youngsters, the Sabres are more than able to sell from a position of strength. Impending RFA Nathan Beaulieu has been a poor fit in Buffalo for two years now since coming over from the Montreal Canadiens. The team owes Beaulieu a $2.5MM qualifying offer this summer to retain him, which seems unlikely. The Sabres could definitely treat Beaulieu like any other expiring asset and trade him away. Jake McCabe is also an RFA in need of a new contract, but is a full-time contributor in Buffalo and seems far less likely to be traded. A team looking to improve their depth in net could look at RFA Scott Wedgewood as an option. As for players with term, the Sabres would surely like to move Vladimir Sobotka. The 31-year-old has another season remaining on his contract at $3.5MM and has been a major disappointment in his first year in Buffalo. Takers may be hard to come by, but the team will likely take what they can get for a largely unnecessary roster piece. With a better fit, Sobotka could still prove to be an effective bottom-six forward. The buried contract of gritty forward Scott Wilson would also be nice to move, but unlikely. Of course, if anyone made a half-reasonable offer for expensive and ineffective forward Kyle Okposo, he would also be moved, but such a deal won’t happen. 1) Secondary Scoring: Buffalo is very top-heavy on offense, with the first line doing the vast majority of the scoring. The young roster forwards should improve next season and the team should be players in the free agent market, but as for this year they could use a boost. A cheap rental would help the Sabres stay in the playoff hunt. However, the ideal addition would be a young player with team control. Nikolay Goldobin, Tobias Rieder, and Nick Cousins are among several RFA names rumored to be available. 2) Forward Prospects: The Sabres have both established and high-potential young forwards on the roster right now. They also have a few promising prospects in Europe and three first-round picks this year. Basically, they’re in great shape with players and projects. However, they lack “prospects”, that intermediate level of guys who could push for a spot in camp or be a difference-maker in the AHL in the next year or two. The current young “stars” of the Rochester Americans have left much to be desired this year. In potentially moving one of their more valuable trade pieces, it would make sense for Buffalo to target some pro-ready forwards. Sabres defenseman Nathan Beaulieu has asked to be traded, reports TVA Sports’ Renaud Lavoie (Twitter link). He’s slated to be a healthy scratch tonight against Calgary, something that has been a recent occurrence as of late. The 26-year-old is in his second season with Buffalo after being acquired from Montreal just before the protection lists for the Vegas Expansion Draft were due. At the time, the hope was that an opportunity for more ice time elsewhere would help him unlock the potential he had shown, allowing him to become a top-four defenseman. Unfortunately for Beaulieu and the Sabres, that hasn’t happened. Last year, he dealt with a concussion and multiple illnesses while spending time as a healthy scratch. As a result, he put up just nine points in 59 games, well below the 28 he had tallied in his final season with the Canadiens. On top of that, his playing time dropped from 19:29 per game in Montreal to less than 16 minutes a night with Buffalo. This season, things haven’t gone much better. His hold on a spot on the lineup continues to be tenuous and he has been a frequent scratch once again. Beaulieu has played in just 26 games this season and while he has been a bit better offensively (his 0.27 point per game average equals his average from his time in Montreal), his ice time has dropped to just 14:46 per night. Clearly, he doesn’t have the confidence of the coaching staff. Beaulieu is in the second and final season of a two-year, $4.8MM contract that he signed shortly after being acquired. He’s owed a qualifying offer of $2.5MM this summer and has arbitration eligibility. 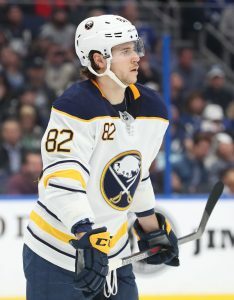 As things stand, it appears to be highly unlikely that Buffalo will tender him an offer so the trade request has been made in the hopes of restoring his value somewhere else. Given his limited role, there probably won’t be many suitors but a team looking for some mobility on the back end may be inclined to take a flyer on him. MLive’s Ansar Khan expects the Red Wings to wait until close to the trade deadline before moving any of their players. The strategy worked well for them last as they were able to garner a strong return for pending UFA defender Brendan Smith. They hold arguably the top trade chip on the back end this season in Mike Green and given his $6MM cap hit, interested teams may prefer to wait to acquire him anyway to reduce the amount of salary they’re taking on. However, it’s also a possibility that doing so could wind up delaying the trade market on the back end as other buyers look to see what the benchmark will be. Goaltender Chad Johnson’s decision to leave his hometown Calgary to go back to Buffalo caught some by surprise. The netminder acknowledged to Postmedia’s Eric Francis that he did receive an offer from the Flames but wanted more of a challenge at this stage of his career. Suffice it to say, the decision hasn’t panned out too well; while he received more money ($2.5MM) than he may have got had he stayed in Calgary, Johnson has struggled mightily with the Sabres, posting a 3.64 GAA and a .884 SV% in 18 appearances this season. Still with the Sabres, defenseman Nathan Beaulieu has left the team to return back to Buffalo to be evaluated for a possible concussion, notes John Vogl of the Buffalo News. He has already been placed on IR. If he is indeed diagnosed with a concussion, it will be his second one already of the season. Beaulieu’s first year with Buffalo has not gone well when he has been on the ice either as he has dropped to the third pairing and is averaging his lowest ice time since 2014-15 while tallying just a goal and three assists in 34 games.